Our Christmas New Year Trek was a festive success. Thanks to everyone who joined and their family, friends and colleagues for supporting the team. We spent Christmas Eve, Christmas Day, and New Years Eve on trek, and went all of the way to Kala Patar, with beautiful views of Everest, AND to Everest Base Camp. Well done team. Congratulations, Merry Christmas and Happy New Year!!!! We are now taking bookings for next year's Christmas New Year Trek. Please click here. The Everest, view from Kala Patar. Photo Scott . Beautiful view on the way to Fungki Thangka. Photo Aless and Luke. 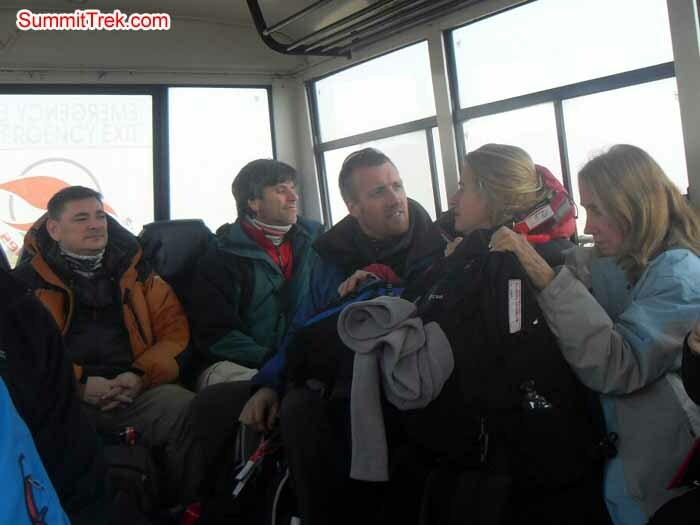 Christmas New Year members at Everest Base Camp. Photo Kaji Tamang. Christmas New year members enjoying the beautiful weather behind Budish stupa. Photo Kaji Tamang. Scott at Kala Patar, backgroud Everest, Nuptse. Photo Aless. Christmas New Year members at Kala Patar. Photo Kaji Tamang. Alex at Everest Base Camp. Photo Aless. View from way down to Fungki Tanga. Stupa and AmaDablam. Photo Kaji Tamang. The team enjoyed the evening in a very nice wooden lodge, Everest Guest House, where the owner made us feel very welcome and even joined us in our card games. He then prepared for us in the morning the most delicious breakfast with some local Tibetan bread and chapatti bread made in front of our eyes whilst we were enjoying the heat of the kitchen stove and sipping our teas. The walk today was extremely pleasant thanks once again to a very nice weather and the beauty of the valleys we were crossing. Despite walking uphill once again (and for the last time!) we decided that being the last day we woukd take our time to stop and look at the villages we were crossing, wishing 'namaste' to the people we met, with a general feeling of gratefulness for this generous country that has looked after us so well in our stay. Even our sherpa friends are singing happy Nepalese songs as we get close to our destination, Lukla. Sooner than we think, we can see the village appearing as it is perched on the side of the steep mountain and we cross again the arch at the entrance of town. We are back here, it feels strange, it feels a long time ago when we left and it has been only two weeks, but we all now feel initiated to the High Lands of the Himalayas. Tonight is our last night with our Sherpa friends, so we enjoyed a very long desired and deserved celebratory dinner and party in our comfortable tea house with a large chocolate cake and liberating dances to some very catchy Nepalese maya music. Everyone joined in as we all felt so good!!! Tomorrow our aerobatic flight back to KTM awaits. Weather again amazing blue skies! View from Tangboche, Everest, Nupste, and AmaDablam. Photo Aless. Kid’s enjoying having toy. Photo Aless. Christmas New Year members celebrating Christmas day at Namche. Photo Kaji Tamang. 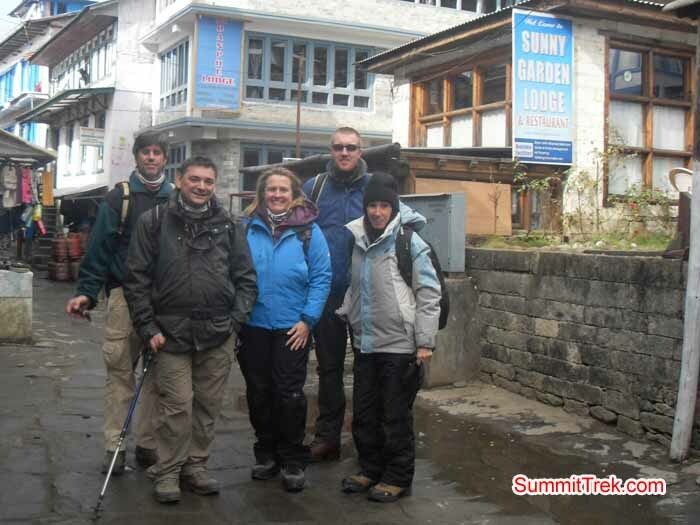 Christmas New Year members way to Pangboche, backgroud Amadablam. Photo Kaji Tamang. Namaste Namche! Today we are retracing our steps back to Namche, the last large village where we stayed before starting the climb in earnest. However, this means from Phunke Tenga an early wake up in the morning and a rather long stretch steeply uphill...The morning is rather chilly, it feels like the last weeks have seen an average lowering of the temperatures in the valley, but as soon as we power up the hill, the blood starts flooding back. We also keep the mood high with song singing and learning more expressions from our Nepalese friends. Today we are accompanied by the icy blue waters of the Dudh Koshi, that we cross a couple of times again on the high suspended bridges. We also start encountering a lot more traffic on the tracks: yaks, dzos, horses and mules carrying all sort of materials, provisions and packs but also a lot more trekkers just starting the same route that we took. It almost seems strange to see so many people after we have had the valleys all for ourselves and enjoyed a silence at times complete. For a moment it feels like we are 'survivors'.......we made it and conquered our goal. Just after Namche as we taste a very juicy local mandarin and we look at Mount Everest from the viewing point one last time. We all recall clearly when we first stood here only ten days ago, however it feels months ago as so much we have lived and sweated in this time. And we look at the top of Everest with a sense of nostalgia already as we remember not so long ago we felt so close..the summit almost in our grasp! The day continues down down down until we reach the end of the National Park and just before exiting we stop for the night in Jorsalle. As I write, the team is resting as usual in front of a hot stove waiting for dinner to be served. Team Christmas and New year group near Lobuche background mount Pumori. Photo Aless. Monkey at Shoyambhu Nath. Photo Darek. Christmas New Year members at thukla Lodge. Celebrating New Year.Photo Kaji Tamang. Christmas New Year members enjoying cardings game. Photo Kaji Tamang. Christmas New Year Cake. Photo Aless. Christmas New Year group enjoying sunny day in hotel. Photo Aless. Happy New Year from the top of the world...although we are now quite rapidly descending! Time seems to have stopped here amidst these fairy valleys and high peaks, but we are now and then reminded of the occurence by the more frequent than before encounters with other trekkers who exchange with us wishes for the New Year. After having consumed our now becoming usual breakfast of (nac) cheese sandwhiches and hot tea, we leave Dhukla on a rather cold but sunny day to continue our rapid descent. 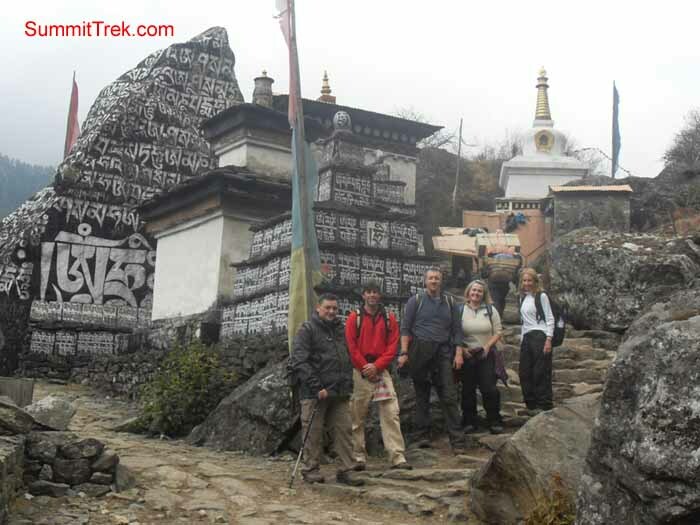 This time we take the high route that cuts us from passing through Periche again, but allows us the views of the valley of Dinboche with Island Peak towering in the middle of the valley with its 6189m summit and a new range of high mountains, including in the distance the very famous Makalu. Just enough time for a couple of pictures and then we press on down toward our lunch destination, Penboche. The much less demanding downward route allows us more time to take in the beautiful scenary that now again turns back from high altitude-glacier-moraine like into alpine. We find ourselves back below the tree line and we follow for a long time the meanderings of the river Imja Khola. For the first time since we have landed in Lukla we start seeing some clouds in the sky, sometimes that get trapped on the side of the mountains and some other times that cover their foothills so that the mountains seem emerging directly from the clouds. After crossing the river Imja Khola, we are once more back walking up the hill of Tenboche till we reach the famous Monastery. This time we are allowed inside where we can attend for few minutes the chants and prayers of the resident monks. 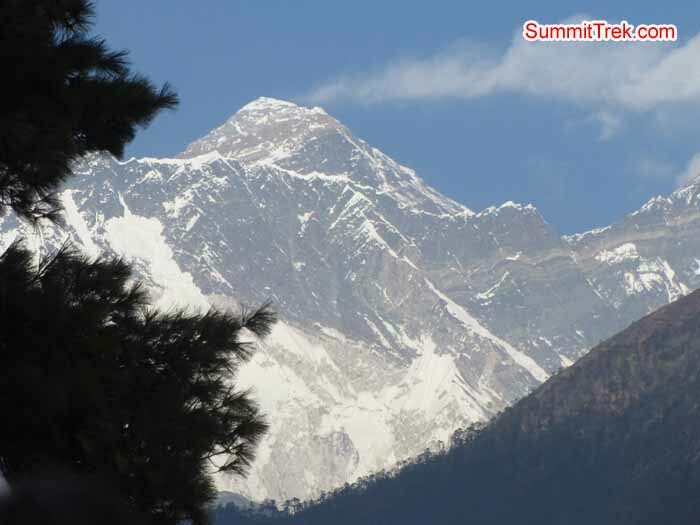 So many expeditions to Mt Everest stop here to get their blessings before attempting the climb. The views from Tenboche are absolutely outstanding as the Monastery sits on the top of a hill and it is completely sorrounded by much higher peaks and even enjoys the view of Mt Everest itself. Again not enough time to enjoy the location as we are kept to a strict schedule by our guide: one more hour to rapidly descend the other side of the hill and reach Phunke Tenga, where we rest for the night. The team gathers once more around the warm stove, however soon the long trek makes us desire a good rest in our comfortable sleeping bags. Dhug Koshi river with beautiful view of AmaDablam. Photho Aless. Farming animal as goat. Photo Aless. Long stairs to reach Shoyambhu Nath. Photo Aless. One of the oldest stupa lies in Center of Kathmandu, which is call Shoyambhu Nath. Photo Aless. Today is the day we have all been waiting for, the day that names the trek itself...the day we trek to Everest Base Camp. The location is not too far from Gorak Shep, so we set off at normal time and we follow a dirt track cut into the side of the moraine, showing how much bigger the mighty Khumbu Glacier was years ago. After about two hours of walking, we arrive at the site, only marked by a large number of prayer flags as the camp is set up every year on the Khumbu glacier itslef and hence needs fo be recreated every time. Only the very pinnacle of Everest can be seen as masked by the nearby peaks including the Nuptse range, however the beautiful and infamous Khumbu Icefall is in perfect view. The beauty of the place does for a moment mask the dangers it hides, but our guide once again reminds us of how many lives have been claimed in this very place and mentioned that every so often clearing operations are conducted to remove the corpses and body parts that the ice returns to us. Having tried to breathe for few minutes the history made in this place, we are to start our return to Gorak Shep as, after a quick lunch, we have to set off for our journey back down the thousands of meters to where the air is no longer thin! Hopefully this will mean that we quickly recuperate our strength and energy and where we will also find higher temperatures! It's a rather long way down to Lobuche and then Dhukla where one of our team members is already waitng for us so we set quite a fast pace down. We arrive at Dhukla when the sun is about to set. We have all had a long day, but the spirits are high and it is New Years Eve, so we spend the evening singing and dancing and trying to teach some songs also to iur sherpa friends, as always around the roaring fire. Aless enjoying in Kala Patar. Photo Aless. Everest Base Camp. Photo Scott. Monkeys are in Shoyambhu Nath. Photo Aless. One of the oldest temple in kathmandu. Taleju. Photo Aless. Plan getting ready to take off from Lukla airport. Photo Aless. Christmas New Year Group at Pangboche with Lama Gasi. Photo Kaji Tamang. Kala means Black and Patthar means Rock. A black rock, or more like a grassy knoll (as it is described in spring)...Kala Patthar is a famous spot for the best views of Mt Everest and the Khumbu Glacier, however it is NOTHING like a small rock!!! We left the tea house when the sun had not yet appeared down in the valley and that meant that the temperature was well below zero so for the first time we all wore our super down jackets. As we approached the path, it looked steeper and steeper and indeed the whole way up to the top was near vertical and at the top across large outcrop of rocks. Most of the team made it within 2.5 hours to the top with our guide patiently helping and encouraging the rear guard. he wind at the top was very cold and strong so we only had few minutes to take some of the most amazing pictures of us with the incredible backdrop of Everest, in its most open and exposed state that we will ever see...without getting up the Khumbu ice fall to camp II and above. A view that was brief, but will stay with us for long. Welcome party after the trek. Photo Aless. Beautiful day just after 15 minutes way from Namche. Photo Darek. Derek taking a picture with Yak. Photo Derek. Buddhist Art on the wall. Photo Scott. The team today reached and passed the 5,160 metres/16,900 feet mark! We officially entered into thin(er) air and we do feel the need for many more breaths than before!!! The winding trail flowed around the contours of the valleys carved by the glaciers taking us relentlessly up and opening up more and more views of migthy tops, including for example Pumari. The lanscape is getting definitely bare with lichens and mosses only covering the large stones that have fallen from the steep mountain sides. All quite tired we finally reached our lodge in Gorak Shep. At a staggering 5140m of height for the first time for all of us, we can tell the environment is testing us: early signs of headaches and hearts racing are common so we decide to have an early night...also in consideration that tomorrow will be the hardest day with a very early rise to summit Kala Patthar. Buddhist Art. Photo Scott. Jokiyos are use for carrying load in Khumbu vally. Photo Scott. Lot’s of small temples in Shoyambhu Nath. Photo Darek. Pangboche village. Photo Aless. Another half day of walking for us. We are very grateful that our walking plan allows us a very gradual acclimatization as almost every day we hear twice or more a day the rescue helicopter collecting injured or sick people from higher altitudes. The first steep rise takes us to Thukla Pass, where there is large area dedicated to memorials of climbers and mountaneers that perished attempting to summit these Himalayan peaks. When we arrive at our tea house in Lobuche we are pleasantly surprised by the presence of a sunroom where we can enjoy the warmth of the sun and the amazing views and rest by reading, talking and obviously playing cards. Card playjng continues into the late evening thanks to finding some new very pleasant companions for the evening from Seattle. Memorial. Photo Scott. Thukla Lodge. Photo Scott. At 3500 m. Photo Luke. Rooms in Tea House. Photo Aless. Today we were prepared for an easy day, but in fact it was even easier than we thought and we arrived at the night destination without even realising it. The landscape now is definitely typical of very high mountains with glacial moraines siding the track often covered in ice. The Dukhla teahouse is a large building perched on the side of the mountain which offers views of Ama Dablam and Cholatse and of the glacial lake of Chola Tsho. We are settled by lunch time and we prepare for a leisurely afternoon of tea drinking, resting, walking to the lake and enjoying the sun. Buddhist stupa and Amadablam. Photo Aless and Luke. Jokiyos are using for carrying load. Photo Aless and Luke. Christmas day at Namche. Photo Aless and Luke. Small kid enjoying the Christmas cap. Photo Aless and Luke. Scott, Ramesh, and Darek resting on the way to Tangboche. Photo Aless. Henri getting bless from Pangboche Lama. Photo Aless. Before we started trekking again today, we paid a visit to the oldest monastery of the valley: Pangboche Gompa, which is about 700 years old, and we were invited to meet the resident Lama Ghese, who kindly blessed us and our expedition to EBC! He was very warm and welcoming and we are sure his kind words and blessing will accompany us to our goal. After the pleasant visit we were back on the trek up, up, up (mathi mathi)...today we were set to break the 4000m limit! And then soon after we stopped in Pheriche. At this altitude we saw that temperature had definitely dropped a few degrees and we encountered more and more wind, which apart from lowering the temperature even further, also blew dust in vorteces all over us. Pheriche lies at the bottom of a wide open valley crossed by the river Dudh Koshi and once again we found ourselves turning our heads 360 degrees to see rocky iced faces of 6000m peaks all around us, and many much higher mountains too. The panorama was stunning especially as the last rays of the sun illuminated the peaks whilst we were already in the dark. The tea house where we stayed has two very sociable owners that kept us warm by constantly refilling the stove with yak poo whilst participating with us in the now usual card game...it is always best to end the day in good humour. Aless rotating the player wheel. Photo Aless. Tangboche Monastary gate, Aless and Luke posing for photo. Photo Aless. Aless in Shoyambhu Nath. Photo Luke. Small kid enjoying the christmas cap. Photo Aless. Merry Christmas from the top of the world! Another beautiful sunny day and we have a leisurely start up the hill behind Namche and along the valley with the Everest range in full view providing some very good photo opportunities. We also passed a number of Stupas and prayer stones reminding us that we will make it to the top.... only if Nature allows. At the top of the hill, the scenery finally opened to show the historically famous Monastery of Tengboche lying on top of a hill (a Nepalese hill that is...3860m) completely surrounded by a crown of high snowy peaks and in patticular by the towering Ama Dablam. The view of Ama Dablam continued to follow us for the whole day as we pressed on toward our final destination: Pangboche. We were tricked once more by two Nepalese typical characteristics: one being that for every upwards gain in altitude there is a descent to be done beforehand and two that for everytime that our guide tells us there is a little up to do we should expect a rather steep stoney path! So instead of being very close to our lodge, we actually had several hours still of walking, however again through a beautiful snowy valley carved by a ice covered river. As we are now approaching 4000m altitude it is clear that the vegetation is changing with the conifers leaving ground to lichen and moss and more and more boulders appearing on the side of the track dragged down the steep hills by the heavy winds and winter storms. All rather tired, we finally make it to the tea house with the sun already disappeared behind the peaks. We had just enough energy to open our Christmas presents and conclude the day with a game of Nepalese Jutpati with our sherpa friends. Wooden ark at Temple. Photo Luke. Wooden art in temples of Kathmandu. Photo Aless and Luke. Kathmandu Darbar Square, nice place to visit. Photo Luke and Aless. Mountain Bird. Photo Aless and Luke. This morning we started our Christmas Eve with a sumptuous breakfast at our Valley View Tea House after a very good night sleep. When looking out of our windows we were welcomed by a clear blue sky again and the high peaks around Namche. Today we are glad we have a rest day and we have time to breathe in the Nepalese way of life through the streets of Namche. We can sit on a stone bench by the side of the street and watch passers by attending their daily business...including a number of dzos, animals that we mistakenly thought to be yaks and instead are a cross between a yak and a cow and are used at mid altitudes between Namche and lower down in the valleys. In the morning we strolled up the hill behind Namche to take in some more views of Mount Everest and the surrounding peaks: Nuptse, Lotse and Ama Dablam. We couldnt help taking more and more photographs as it seems still almost incredible that we are finally here after so much reading and hearing about the stories of life and death in the Khumbu Valley. After sipping our favourite drink, hot mango juice, we continued exploring the village and its many shops to find some locally crafted goods. In particular we found a very nice Tibetan lady who has half her family left in Tibet when she had to move to Nepal. The last treat of the day was a very hot shower...considering we may have a number of days ahead without the possibility to have one! After dinner we had a special surprise from the owner of the Tea House, who has been many times expedition leader for one of our heros, Reinhold Messner, in the form of a Christmas cake cooked by his lovely wife! All of the team including our guide and our porters gathered merrily around the table to enjoy the food and then...many games of cards, as we were introduced to the game of Jupati. It's all quiet now as the team is in their sleeping bags preparing for the long day ahead. Mani Rock on the way to Phakding. Photo Kaji Tamang. Alessandra Badino enjoying staying at long bridge toward to Phakding. Photo Kaji Tamang. 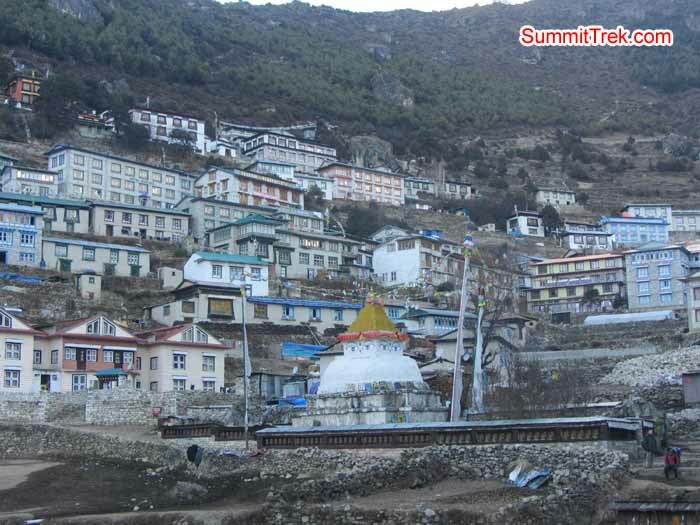 Namche Bazaar, capital of Khumbu valley. Photo Alessandra Badino. 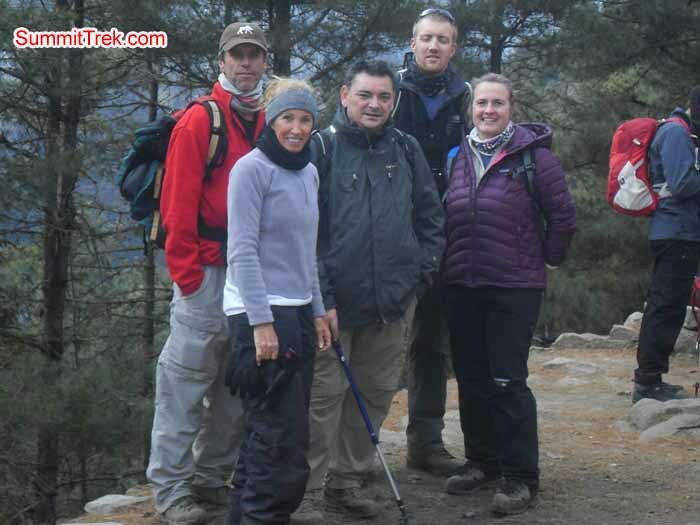 Team posing for photo in Namche hill. Photo Kaji Tamang. Today we woke up to a pretty cold morning but we were comforted by a hot bowl of porridge! Soon we were ready to take off for our journey, preparing for our long day to take us to Namche Bazar at a staggering 3440m. Two hours later our first stop was at the Park Entry Checkpoint where we registered and received our permits to visit the Khumbu valley further. The sky was stunningly clear and blue, the best we could have ever wished for and the sun was creating games of light between the dark valley and the bright snow peaks. 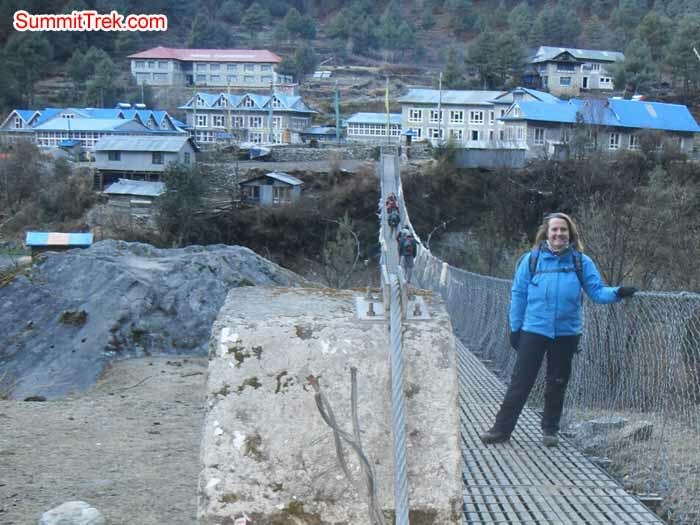 We got to cross the Dukhosi river in many places via the use of Nepalese suspended cable bridges...not recommended for people afraid of heights...until we reached the last village before Namche where we stopped for lunch. We met various groups from all over the world also making the trek up to EBC and as we all trek the same route we have already started seeing the same faces stopping at the same points...Surely by the end of the trip, we will make some more friends!We also criss crossed many times our way with our porters, who are so young, yet so strong and so fast they often charge ahead and then wait for us to slowly catch up. Our guide Kaji, instead, is very patient and makes sure we are all ok by bringing up the rear...and in doing so ends up being asked all sorts of questions about what we see, about Nepalese customs...and especially about the steepness of the trek ahead!!! The lunch stop was definitely a pleasant time as we could enjoy the sun and the views from inside a warm and comfortable tea house. However all good things come to and end and we knew we had to face the hardest part of the day, the steep final up-hill to Namche. It was indeed all and more we had thought of but we managed to get to the end of it only by a careful mastering of the art of slow progression. The greatest motivation to proceed came a third of the way up, when we finally enjoyed our first view of the distant, but nevertheless majestic Mount Everest and its ever present cloud and snow plume streaming from its top. At a staggering 8 hours after we left Phakding and with about 6 hours of walking on our boots, we finally reached Namche, walking along its colourful shops and lively bars...such a contrast to the day...we finally settled for the night in our tea house and got ready for a well earned hearty hot soup and vegetable noodles. Tonight we can rest peacefully knowing that tomorrow...is rest day!!! Derek Billib enjoying staying at long bridge toward to Phakding. Photo Kaji Tamang. 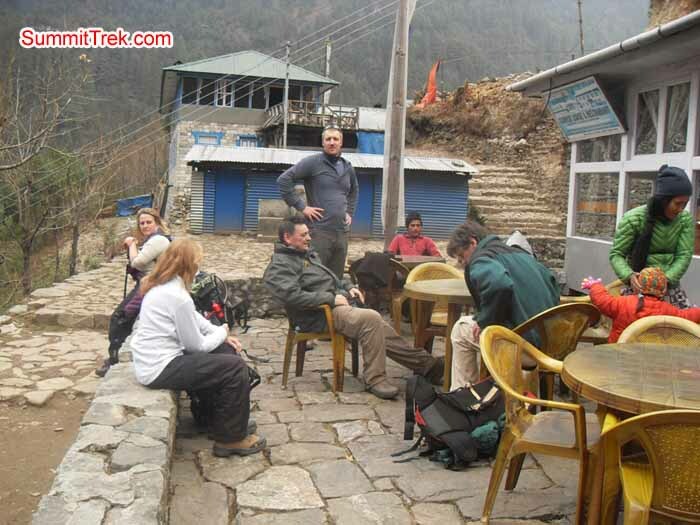 Team members having rest between Lukla and Phakding. Photo Kaji Tamang. 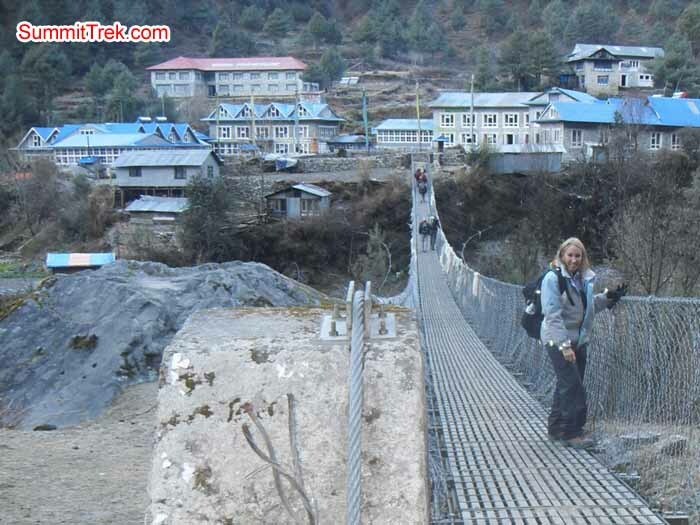 Team members are in the street of Lukla. Photo Kaji Tamang. Team members having a photo with our strong porter for the trek. Photo Kaji Tamang. After a couple of days in KTM getting blessings from the Nepalese Gods and a lot shopping for the remaining gear, the adventure really begun today with our flight to Lukla.We were on the second flight out and we had to wait for a while until the weather properly cleared, then finally what we have been all waiting for: we were on the plane for the most amazing flight in the world. As soon as our little Dornier 228 climbed up high, we started having some amazing views of the high Himalayan ranges with many snow capped tops. Not that everybody has saw it, because the passenger next to Scott was feverishly praying to the deity of his choice. Exhilarated as we were, we kept on making videos and taking photos. We were still stunned by the views when we realised that the aircraft was getting inside a narrow valley and very close to both sides of the steep mountains covered in conifers. The aircraft was aiming straight to the short, narrow and steep airstrip of Lukla, one of the most spectacular and dangerous airports in the world. Everyone got really excited on approach and we couldnt help clapping at the skills of the pilot who landed us perfectly in the shortest distance. So there we were, in Lukla, a beautiful mountain village full of little shops and cafes. We stopped for lunch here and then started our walk toward Phakding, our first night stay.We descended about 200 meters along the well trodden path of the Khumbu valley. We saw our first yaks and some mongoose running along the river cutting the valley with its ice blue water.We also met our 3 sherpas who will accompany us in the trip and kindly relieve us of carrying our bags. We were stunned by the strength demonstrated by all sherpas we saw along the way carrying all sorts of heavy loads: from a bundle of logs to 10 sheets of plywood, burdens so large and heavy that they had to bend 90 degrees to bear the load up the steep steps. And at the top of the last steep steps, there is our tea house for the night. The lodge is made of a dining room dowstairs and double bedrooms upstairs. Soon after we stop walking and we start unpacking in the rooms, we all suddenly feel the cold creeping in the evening and realise that we are in for our first VERY cold night! Team members are getting ready to go in the plan for Lukla. Photo Kaji Tamang. 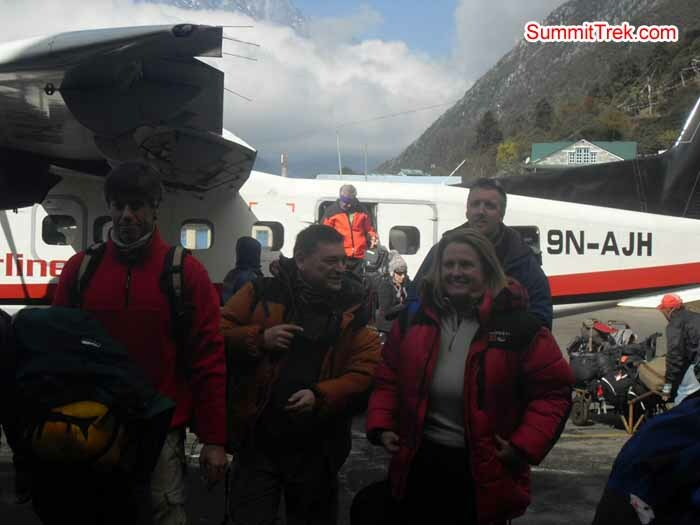 Team members are in Lukla airport. Photo Kaji Tamang. Team toured around Kathmandu and met with the leader and went to the office. Team Arrived Kathmandu and went to the hotel.